Automatically Track Workers Time Spent on Each Job or Project. For a 14-Day Free Trial, click here! 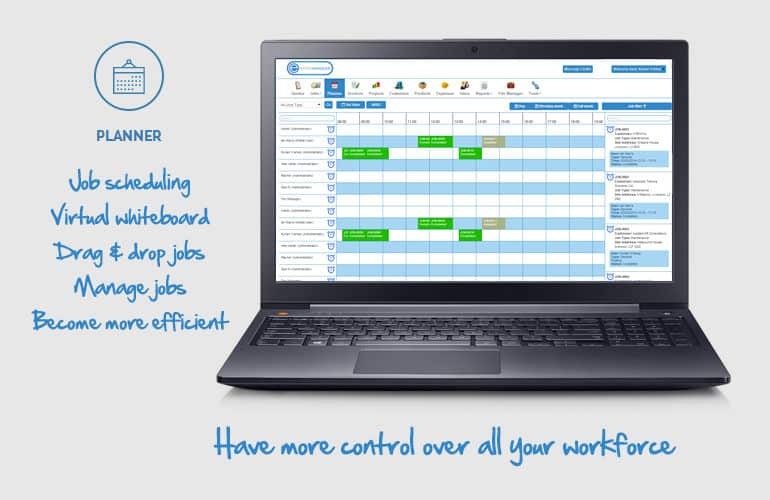 Full Featured Time Tracking Software Designed to Manage and Streamline Your Entire Business from Start to End. When workers are added to Eworks you have the option to add in their cost and charge per hour. Whether they are a supervisor in the filed or an assistant helping for the week. When the mobile App users accept and change the status of a job the times are tracked. This allows you to cost your jobs correctly as their travel and on site time is added to the costings of the job. All you must do is add in your labour and travel line item with the correct quantity and send the job for invoicing. As jobs are created and assigned to workers out in the field, it is slotted into that specific time on the Time Planner. This gives you a visual representation of when jobs are to take place. If your office is unsure of who to assign to a job, and the availability must be checked first, they can send the job directly to the Time Planner and with the drag and drop method the job can easily be added into an empty slot, which will be sent immediately once saved. Jobs that are scheduled as floating appointments (no specific date or time and only a complete by date) will only display on the Time Planner once the worker actions that they are on route to the job. Each job that is linked to a project will be added to the total time spent on a project for a specific customer. When a job is linked to a project each workers times are tracked, stored and added to the relevant report for a workers time sheet, to the total time of the project and to each individual job in a project that a worker has completed. 1How Can Time Tracking Software Help Your Business? Implementing software that will automatically track each workers time makes your office staff and field workers more efficient. Your office can rely on an all in one system to track travel time, time spent on site and travel time back to the office. Your office can pull reports that are built immediately and don’t require manual input. This ensures times are accurate and that field workers are not over or under paid for their working hours. Your field workers will in turn become more productive as they won’t have to spend time filling in their hours at the end of the day or week as time is tracked as the status of a job is changed on the mobile App. Never lose a job sheet again.